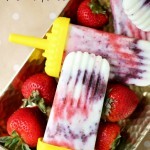 I created this frozen fruit pop recipe in partnership with Silk and Tapinfluence. all opinions are my own. With temperatures on the rise, I’m spending more and more time outdoors. When it’s nice outside you can usually find me in the back yard with the kids, walking to the neighborhood park, or on an excursion somewhere green. I love being out in nature, but let’s face it, it gets hot out there! Everyone needs a quick way to cool down after a few hours in the sun, and the obvious first choice is going to be a tall glass of water, but sometimes I’m in the mood for something a little more flavorful. Sometimes I want a treat that I can feel good about eating and not have to worry about loading up on sugar or artificial ingredients, so I took one of my favorites from childhood, put a better for you spin on it, and came up with these amazing three ingredient creamsicles made with Silk Soy Milk and fresh fruit. These babies are packed with plant-powered protein, fresh fruit, and they taste great! 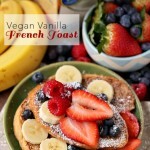 They are the perfect cool down after a workout or a day outdoors, and they are completely vegan! 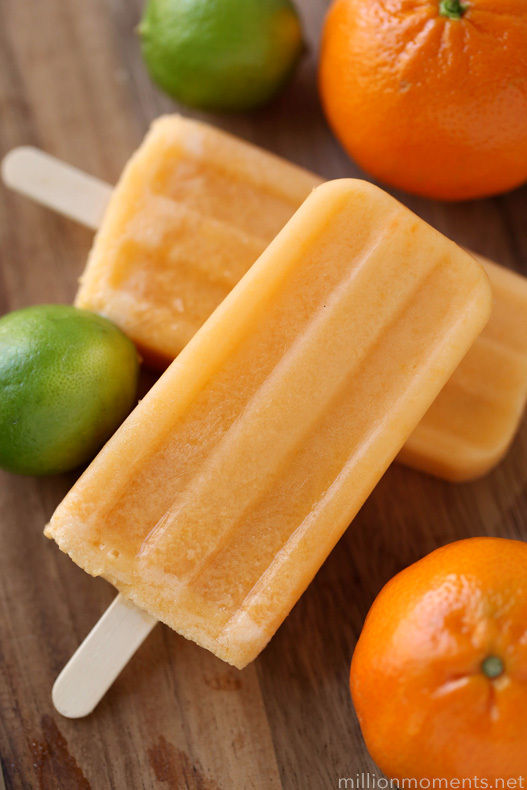 Most creamsicle recipes I’ve found are heavy on dairy and sugar but the last thing I need when I want to replenish my energy and cool down is a heavy, sugary treat. 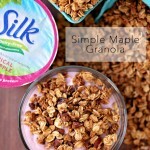 We don’t drink cow’s milk, so I used Silk in these and they turned out great! If you’ve been here before then you have probably read one of my many posts about my love for the Silk brand. Not only do they offer a complete line of wholesome dairy alternatives that contain 50% more calcium than dairy milk, but their products are responsibly made and non-GMO verified which I love. Oh, and they taste great too! 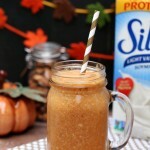 2 cups Silk milk alternative of your choice. 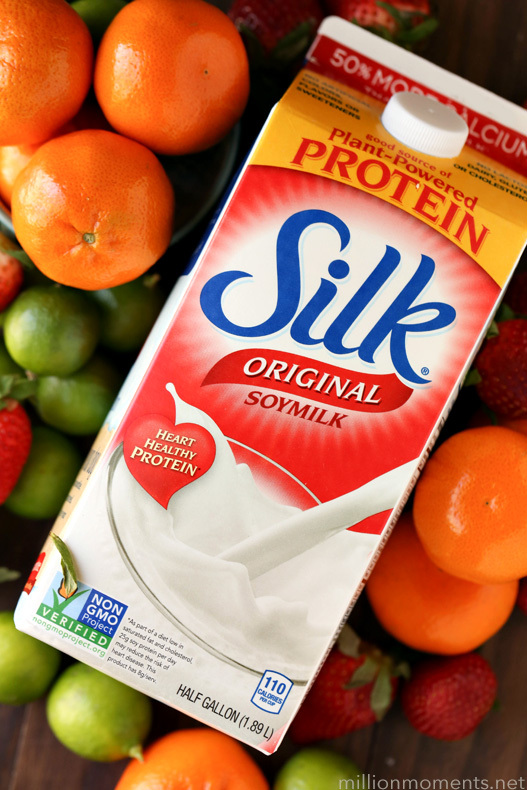 Both vanilla and original Silk Soymilk work well here. To make these, start by peeling/dicing your fruit. 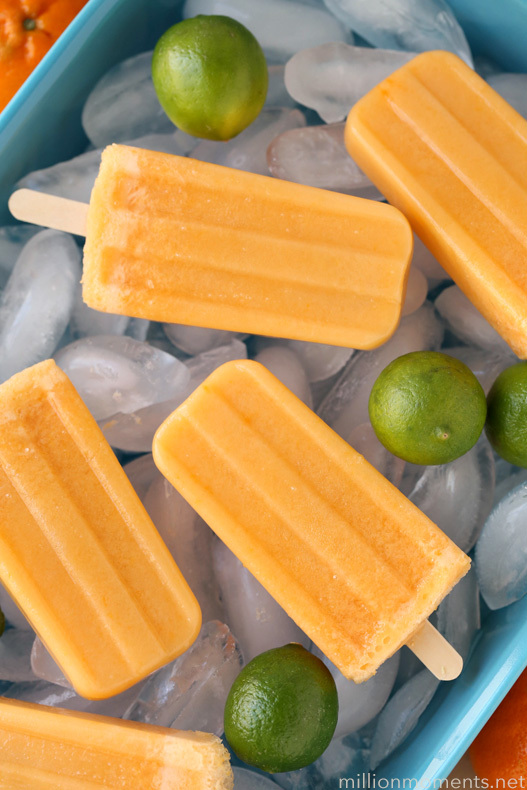 For this recipe I used three different flavors: tangerine, key lime and strawberry. 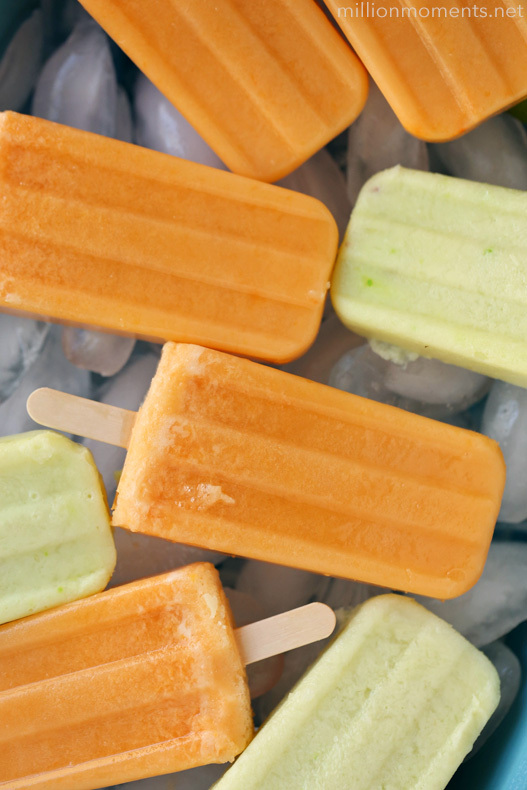 (Hey, who says creamsicles have to be orange?!) So anyway, for eight creamsicles that will be around five tangerines, eight key limes, or six strawberries. After you have your fruit de-seeded and thickly cut, add it along with your milk and yogurt alternative to a blender and pulse for one minute or until evenly blended and creamy. 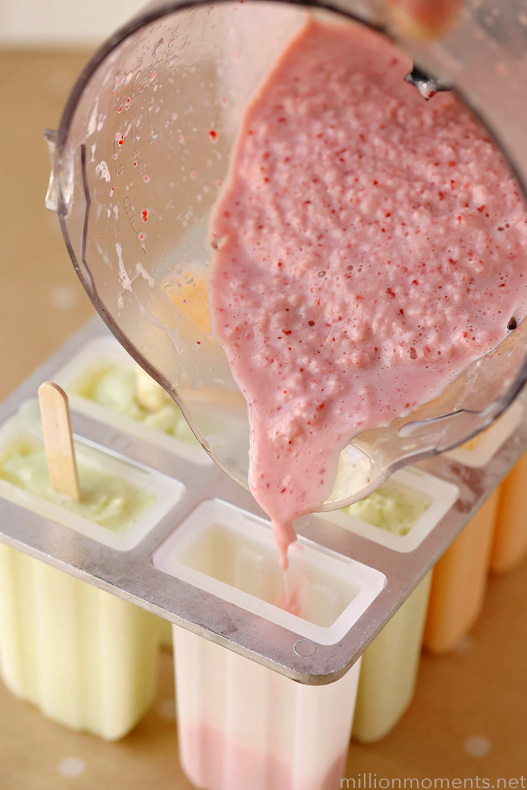 After that, just pour in your popsicle mold and freeze! When they’re ready pop one out and enjoy! The tangerine flavor was hands down the family favorite. It has a great balance of citrus with a hint of sweetness, and I love how fresh and fruity it tastes! Coming in close second is the key lime. I’m a sucker for anything lime, so these are fabulous! 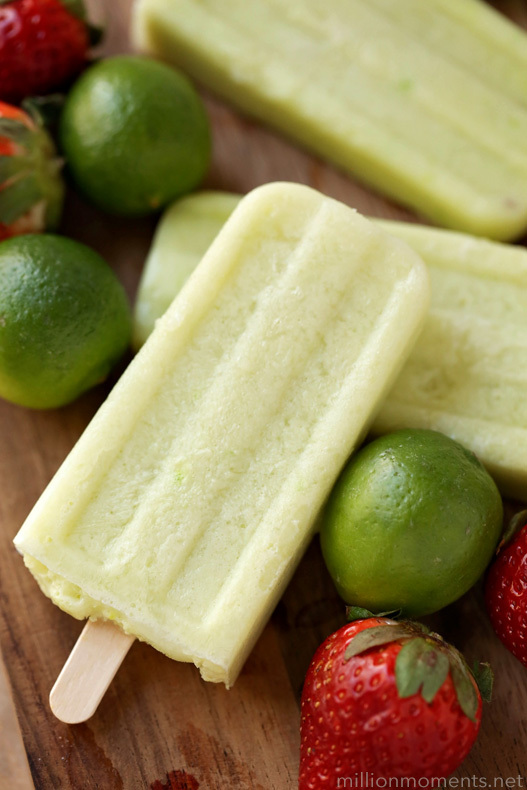 I wanted to keep these simple so I just used the fruit, but I think adding in some graham cracker crumbles would up the yum factor and make it taste just like a key lime pie! 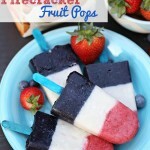 I love how easy these were to make, and this recipe works well with almost any fruit flavor so you can really make it your own. I think I’m going to try raspberry and pineapple next! If you want to whip up a batch for yourself, don’t forget to head over and grab a coupon to purchase Silk today!